Blondie and Brownie: A Horchata Head-to-Head!!! Horchata is the new in-style flavor of the moment. Horchata is a rice-based drink common in many Spanish-speaking countries, and of course each region has their own variation. The most common variety in the US appears to be Mexican horchata, which can contain cinnamon, vanilla, sugar, and sometimes almonds and/or lime zest. 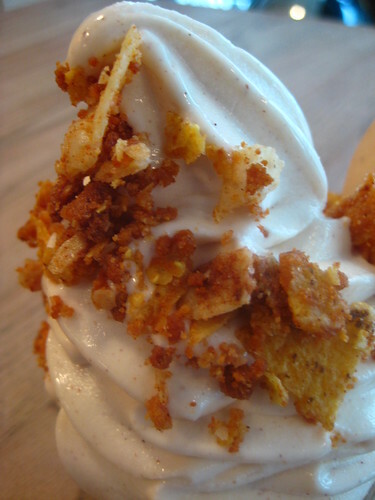 And right now, it's available in ice cream form as dessert at two major places, Shake Shack and Momofuku Milk Bar. To the head-to-head. My first stop was the Milk Bar, the main reason being that they don't run on a schedule so it's easier to just stop by. 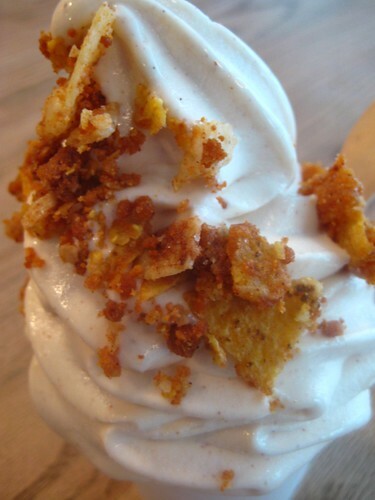 I got a cup of the horchata soft serve ice cream, and for giggles, the cinnamon sugar tortilla topping. It was delicious, something that would be the perfect ending to a Mexican meal. This version did taste a bit too one-note favoring the rice side. I felt it could use a bit more cinnamon, but the topping made up for this. My real problem, and this is my BIG problem with Milk Bar, is that the cups don't allow for drippage. It's soft serve, it's going to melt fast; within moments, it was melting all over my hand. Major con. Then on Wednesday, I stopped by the Shack to taste their Cinnamon Almond Horchata. No, this isn't a true head-to-head since one's an ice cream and the other's a custard, but they are both dessert. Shack's was a little more rounded, the rice, cinnamon and almond flavors were more pronounced. Of course, this one was more eggy, it is custard. I did wish for some more of the cinnamon sugar tortilla topping though. Over all, I'd eat both. When pressed, my true winner would be the custard with the topping, but that just wishful thinking. 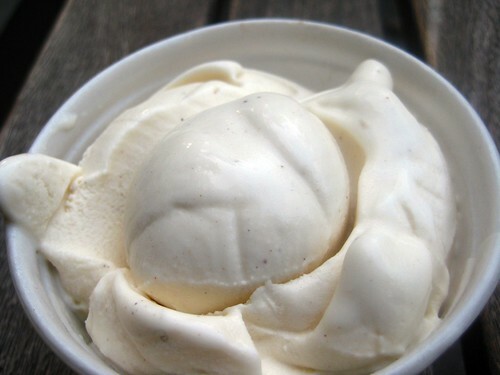 Remember that the custard is on Wednesdays in September only; there's no saying if it'll ever come back after the 30th! For a good article on the regional horchata variations that appeared in the June 18, 2008 edition of The Washington Post, click here. No offense to these two establishments b/c I love them both, but I think Big Gay and Miss Softee could serve this up way better. Like more horchata-topping. Sorry to comment, like, 100 times on your blog today, but I keep getting excited by things. I love, love, LOVE horchata since trying it for the first time only a year or so ago and had no idea horchata-flavoured custard/ice cream existed. Now that I'm reading this post a month later, I'm scared they won't be there still, but at least I'll know to look for them next year. SO GREAT!